Our Sunday parties are private parties designed to host up to 30 guests. You will have exclusive use of the gym during your gym time. These are for ages 5 and above. It will be an additional $20 for each person over the parties limit. Pick up to two party types for Sunday Parties! Games: Participants will play a mix of different fun parkour games. Some of the games include: Floor is Lava, Obstacle Challenges, and an M Lab Original-Grinch! Ninja Warrior: This will be the closest experience to the show a little or big person can have! We will use our vast experience to design a course for any age or skill level. The participants will learn the obstacles before getting the full American Ninja Warrior experience of running the entire course! 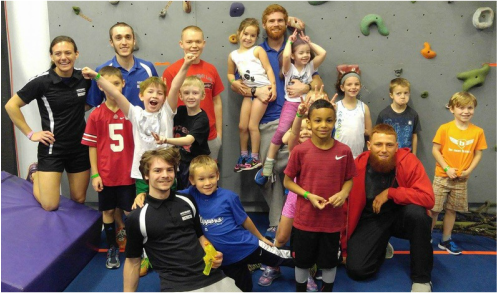 Open Gym: Instructors will monitor and assist children or adults while they have free roam over our Ninja Warrior obstacles, parkour equipment, foam pit, and trampoline. Nerf Party: Children or adults get to use our urban environment and Ninja Warrior obstacles to play various Nerf war games such as capture the flag! (Please bring your own nerf weapons. We have only a limited number of Nerf darts and supplies for those who cannot bring their own). 'Get to know the perks! All ages are welcome: you could be a Ninja Warrior super fan kid or an adventurous adult looking for a fun, active party! We have the solution for you! American Ninja Warrior Style Lights and Sound! ​​If there is more than one birthday person, there are some options. You can split the month into two weeks for the two people, or use the free month for just one person. You can add a month pass for the second for $50. Add-on MLab Ohio multicolor wristbands as a party favor for $1 each! Check out our calendar of available time slots below to book your party today! Don't delay because we are often booked 2 months in advance. After picking your time slot, you will be prompted to provide some information, like the number of kids/adults, party type(s), and the age range of those coming. Once you have paid the $75 deposit, your reservation is secure and we look forward to celebrating with you! Please note: To reserve your time slot, you will need to put down a $75 deposit. Your deposit will be subtracted from the total price of the party. Deposits are non-refundable. If you need to change the date of your party and it's more than 2 weeks before your initial date, we can transfer the deposit. If it's less than 2 weeks, you will need to pay a second deposit for the second party date. *Important note about booking: If the time slot is blocked out in light blue that signifies the time slot is already booked. If the time slot is a dark blue with a time stamp (i.e. 10:00am) that signifies the time slot is available. **Birthday party registration will involve creating an account, but you don't need to become a member. When you invite your guests, ask them to fill out the online waiver ahead of time so you don’t have to use party time waiting on people filling out their waivers. If any parents of children at Sunday parties want to try a few obstacles, they should also fill out a waiver for themselves. You can find our waiver on our home page at the bottom left-hand side. Remind people to wear athletic shoes and socks so they can run around the gym comfortably. ​​Food: You’re welcome to bring in food and drink to the party room. There are multiple pizza places close by. Decorations: Feel free to bring in decorations that you can put up and take down quickly and easily. Set-up time: About 45 minutes after your party starts (halfway through your gym time) you will be able to set-up/decorate your party room. For Sunday parties, you can store things in the smaller party room until the VIP party room is cleared. Tableware: We provide basic paper plates, cups, napkins and utensils. VIP Party room: There is an 8 foot table and two 6 foot tables with a total of 25 folding chairs. There is a small sink, a microwave oven, and we have a refrigerator and freezer in our employee room that you can ask to use for ice cream, etc. Please label anything placed in the fridge! TV/Wi-Fi: There is a TV in each party room with internet apps such as YouTube, FaceBook, etc. Local channels and minimal cable channels are available in the VIP party room. Local channels are available in the smaller party room. Wi-Fi is available throughout the gym. You can watch the gym through the security cameras from the VIP party room. Age limits: Participants need to be 5 years old or older. There is no upper limit on age, but participants should not attempt more than their physical capabilities. Parents: The party is intended for the children/adults participating to have fun, but the parents of children at Sunday parties can try a few obstacles, as long as they have filled out and signed the smart waiver for themselves.